The Hayabusa2 spacecraft reveals new clues about the early solar system. The visible-light camera and a near-infrared spectrometer on Hayabusa2 confirmed the lack of water on Ryugu. Researchers said they were unsure how the parent body that produced Ryugu became so dehydrated. A Japanese spacecraft studying the near-Earth asteroid Ryugu beamed home new data revealing that the space rock has less water than scientists expected. The spacecraft, Hayabusa2, arrived at Ryugu on June 27, 2018. Since then, the probe has surveyed the asteroid's surface and landed multiple robotic probes on its rocky terrain. Last month, the Japan Aerospace Exploration Agency (JAXA) completed a complicated touchdown maneuver to collect samples from Ryugu's surface, which will be brought back to Earth in a return capsule in late 2020. After almost a year surveying Ryugu, the Hayabusa2 spacecraft has already collected invaluable data that may help scientists better understand the early solar system. "Just a few months after we received the first data, we have already made some tantalizing discoveries," Seiji Sugita, lead author of one of the studies and a researcher from the University of Tokyo, said in a statement. "The primary one being the amount of water, or lack of it, Ryugu seems to possess. It's far drier than we expected, and given Ryugu is quite young (by asteroid standards), at around 100 million years old, this suggests its parent body was much largely devoid of water, too." The new data collected from the Hayabusa2 spacecraft is the focus of three studies, which were published today (March 19) in the journal Science. Scientists think Ryugu formed from a much larger parent body that contained water ice and organic molecules. However, it is unclear how the parent body became so dehydrated, researchers said in the statement. A possible explanation is that this body was internally heated by radioactive materials that stripped it of most of its water, one of the new studies said. Alternatively, the parent body may have suffered prolonged bombardment by other rocky bodies. 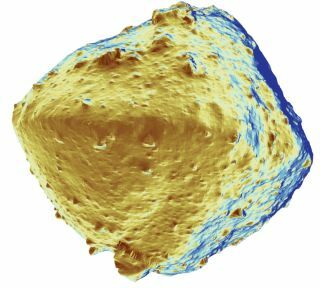 Images of Ryugu revealed large boulders and impact craters across the entire surface, according to the study. Researchers confirmed Ryugu's relative lack of water — or, specifically, hydrated minerals — using the visible-light camera and near-infrared spectrometer on Hayabusa2. This was a surprising discovery, as Earth's water is believed to have come from asteroids. Thus, the new findings could help scientists better understand the chemical composition of the early solar system and the materials that were essential for life when Earth formed, the statement said. "This has implications for finding life. There are uncountably many solar systems out there, and the search for life beyond ours needs direction," Sugita said in the statement. "Our findings can refine models that could help limit which kinds of solar systems the search for life should target." The new data also shows that Ryugu has an oblate "spinning top" shape, which suggests that the rocky body may have once spun at twice its current rate, according to one of the other studies, led by Sei-ichiro Watanabe from Nagoya University in Japan. The third study investigated Ryugu's composition and found that hydrated minerals were widespread on the asteroid's surface, though the other studies make clear they're not abundant. In addition, the study suggested that heating from space weather events might explain the lack of water on Ryugu. The asteroid Bennu, which NASA's OSIRIS-REx mission is exploring, also has a "spinning top" shape. However, researchers have found evidence of abundant hydrated minerals on Bennu — much more of them than Ryugu harbors. "Thanks to the parallel missions of Hayabusa2 and OSIRIS-REx, we can finally address the question of how these two asteroids came to be," Sugita said in the statement. "That Bennu and Ryugu may be siblings yet exhibit some strikingly different traits implies there must be many exciting and mysterious astronomical processes we have yet to explore." Watch Japan's Hayabusa2 Grab a Piece of an Asteroid in This Incredible Video!